The DC values shown on the map are indicative values of the moisture content of a deep layer of compact organic matter. Peat soil is an example of deep compact organic soil. The DC is used to indicate the potential for fire to smoulder in peat which is the primary cause of smoke and haze in Southeast Asia. It can also be used as an indicator of difficulty in extinguishing deep burning peat fires as well as an early warning indicator of serious haze events. 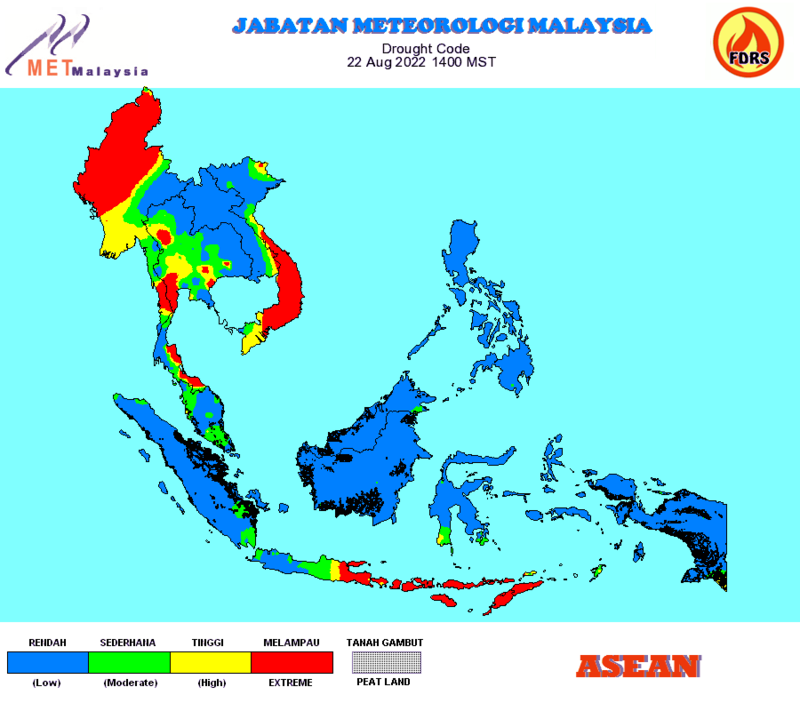 Low Typical wet-season conditions and severe haze periods are unlikely. More than 30 dry days until DC reaches threshold at which point severe haze is highly likely. Medium Normal mid dry-season conditions. Between 15 and 30 dry days until DC reaches threshold. Burning should be regulated and monitored as usual. High Normal dry season peak conditions. Between 5 and 15 dry days until DC reaches threshold. All burning in peatlands should be restricted. Weather forecast and seasonal rainfall assessments should be monitored closely for signs of an extended dry season. Extreme Approaching disaster-level drought conditions. Less than 5 dry days until DC reaches threshold, at which point severe haze is highly likely. Complete burning restriction should be enforced.